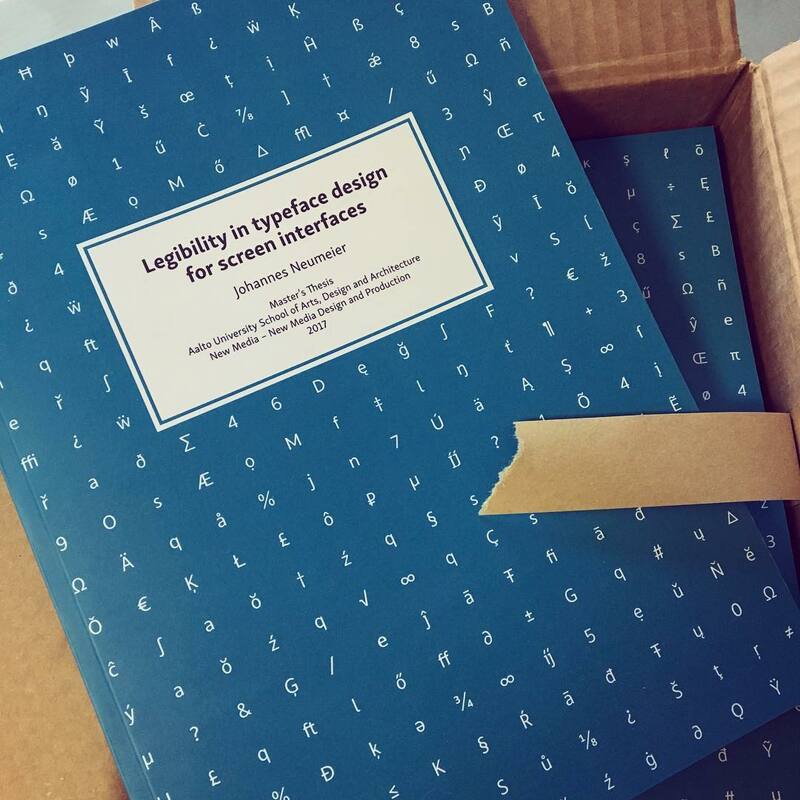 My Master’s thesis on legibility in type design is now out! As part of my studies in New Media I designed a typeface family (stay tuned for the release later this year) specifically geared towards application in digital user interfaces. The design of the typeface was supported by a methodical research of the requirements and known best practises of this genre of typefaces. On the one hand the text provides an overview over current craft knowledge. Related typeface categories are compared for similarities, the features of the most significant interface typefaces of the last 20 years are analyzed, and interviews with type designers Aleksandra Korolkova (ParaType), Tim Ahrens (Just Another Foundry), Lukas Paltram (DaltonMaag) as well as Jarno Lukkarila (Typolar) are featured. On the other hand, the text looks into the psychological aspects of reading and gives a review of influential legibility research, past and present. Furthermore, aesthetic and economical aspects of designing typefaces for user interface use are listed as some of the most influential motivators for new projects in this area of type design. All of this is contrasted to the development of my own Silta typeface design and the process of tailoring and testing it for user interface typesetting. The most essential important point is the amount of attention that ideally should be paid to legibility, and why this is so important in this use case. For a closer look feel free to read the full thesis from the below link. If you are interested in a physical copy, I have a couple of spares left that I can send in return for postage costs. Feel free to get in touch.